Soldier: 76. Is he a hero, fighting for justice and order in a world gone wrong? Or is he a reckless vigilante, endangering the lives of innocents in a selfish quest for revenge? And the greatest question of all: Is he wearing that mask because he's the kind of hypochondriac who's more worried about catching a cold than a bullet? The answers, and the identity of the masked man, are revealed in the origin story video playing above and the lengthy bio Blizzard posted yesterday. Soldier: 76 is Jack Morrison, the first official Commander of Overwatch, whose skillful stewardship helped bring about a golden age for humanity. But his promotion over fellow Overwatch officer Gabriel Reyes led to a rift between the two that never healed, and two decades later, Camelot, again, crumbled beneath the weight of ambition and envy. It's a pretty good yarn, especially for a guy in a team-based online shooter, which generally speaking isn't a genre that's overly conducive to intricate plots and deep characterization. But Blizzard didn't get to where it is today by half-assing things, and while I do maintain a certain affection for the era when Diablo was just a jerk in the basement, this kind of fiction is a lot of fun for fans. And if you just want to shoot people in the face, that's cool too. Speaking of which, Soldier: 76 packs an experimental pulse rifle that also fires high-powered Helix rockets—as befits his Soldierly status—and wears a pair of Super-Goggles (actually a "Tactical Visor") reminiscent of something Elton John might have rocked back in the 70s, or perhaps Commander Shepard at some future date. 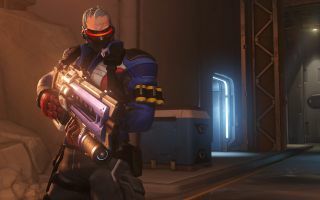 Find out more about Soldier: 76 at Battle.net, and don't miss the gameplay trailer and screens below. Overwatch is set to go into beta this fall.